"One night, about two years ago, I decided to go on the Internet and that is when I found out about Nerve Support Formula. I started taking it and had some relief within a short time. "I am SOOOO glad to have found this product. When I see the commercials on TV for expensive therapies, I don't understand why more professionals don't use Nerve Support Formula." "My nerves continue to get healthier and I can sleep at night, which is a great relief. So I will keep on taking your product. "Can't imagine what it would have been like if I had not found your web site." "The Nerve Support product has been very effective for me. "Using my second bottle provided total support and it continues to do so. I was so happy to receive my current supply and have seen great results. "I have been taking the Nerve Support Formula for just a short while now, and there seems to be a noticeable difference. "Thank you for your email and your advice. I am very optimistic that these vitamins will do the trick!" "I wanted to let you know that my husband and I met our daughter and grand kids in the Tennessee Mountains and went hiking! "Thank you for a product that works. I am very pleased with your Nerve Support Formula." "I am happy to report that my doctor is very supportive of me taking these supplements. "I am so grateful that this product is working. "I greatly appreciate your support and your follow up using these products. I am telling everybody that I know about this product." "I researched and found the Nerve Support Formula and decided to give it a try. I received the Nerve Support and right away I felt an improvement. I have been taking it every day and my legs have been getting stronger and healthier. “Now, a year later I am still taking it every day and I am so thankful for the wonderful results. 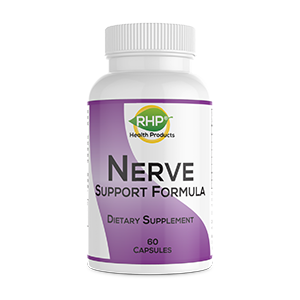 "I have recommended the Nerve Support Formula to family and friends, and I recommend it to anyone who wants healthier nerves. What a blessing!" "I am very happy with the progress. I open pop cans and do all kind of things easily. I will continue with the Nerve Support at the same level. "I have been on the Nerve Support Formula for many months and have had great success with it. I am very thankful for the formula and what it has done to the quality of my life.